Reports flooded in today stating that the warning areas off the coast of Southern California—around the Navy’s Pacific Missile Range—would be activated, causing noise issues associated with re-routed LAX operations. Theories flew, some being totally absurd. In the end, it was exactly what it should have been—a Trident submarine-launched ballistic missile test. Most people go about their lives in Los Angeles with no idea that some of the world’s premier military operating areas lay not far off of their coast, one of which can especially be used for sending ballistic missiles downrange toward the South Pacific. You can see all these military operating areas in this map, with the elongated one off of Southern California being used long-range missile launches like the Trident D5 launch tonight. 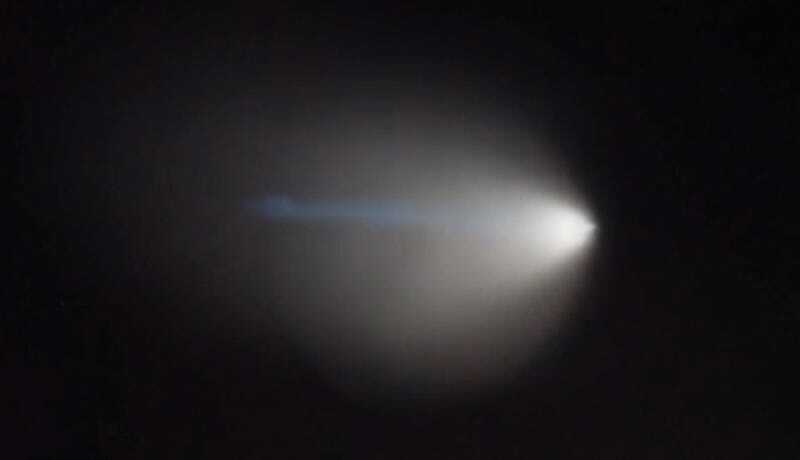 Beyond the fact that Naval Base Ventura County admitting that it was a Trident launch, the tell-tale sign that tonight’s activity was ballistic missile launch was the swirling, almost surreal trail it left as it tore west through the early evening sky. We have seen these incredible atmospheric rocket launch phenomenons many times before, and each seems to have its own unique flavor. At this time it is not clear if the warning areas will be activated for more nights this week, or if this test was the objective of closing the airspace, which is now complete. Hopefully there will be more launches with more spectacular photos and video, although those around LAX may have to deal with a little more jet noise than normal in the process.